The Denver Day of Rock takes place in Denver Colorado in May. Join tens of thousands of music fans in Downtown Denver for these fantastic concert events. With a lineup of great headliners, this annual musical celebration in Denver Colorado has grown to a very fun and family friendly event. 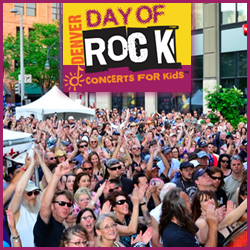 Don’t miss the opportunity to have a great time experiencing live music this spring in Downtown Denver Colorado at the Day of Rock!